The 1966 Topps Venezuelan Baseball Card Set is nearly identical to the U.S. issue of the same year, but it contains only cards #1 through #370. The 1966 Topps Venezuelan baseball cards can easily be mistaken for the regular Topps cards. The difference is that 1966 Topps Venezuelan baseball cards appear "dirty". 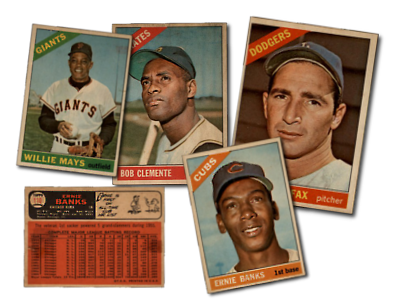 The 1966 Topps Venezuelan cards have a sepia color tint, and the borders appear beige, when compared to the standard Topps cards. The cards also have a darker shade of orange on the back. Due to the small number of cards printed, the 1966 Topps Venezuelan baseball cards sell for a sizable premium over their American cousins. Printed on a cheaper paper stock than the regular Topps cards, the 1966 Topps Venezuelan baseball cards are much more difficult to find these cards in high grades. Most of the cards available today, are in very rough condition. CLICK HERE if you want to sell your 1966 Topps Venezuelan Baseball Cards. Showing 1 to 74 of 74 products.